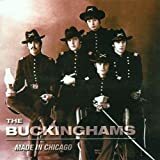 The Buckinghams are an American Sunshine pop band from Chicago, Illinois, United States. They formed in 1966, and went on to become one of the top selling acts of 1967, charting their only five Top 40 hits in the U.S. that year. The band dissolved in 1970, but re-formed in 1980 and as of 2017 they continue to tour throughout the United States. Have You Noticed You're Alive?